Dirty diesel school buses emit dangerous pollutants that kids breathe into their developing lungs, causing respiratory illnesses, aggravating asthma and exposing youth to cancer-causing pollutants. That’s why the League of Conservation Voters’ (LCV) Chispa Arizona program is calling on Governor Doug Ducey and our decision makers to put the health of Arizona’s youth and communities first by using the state’s $57 million Volkswagen (VW) settlement to fund clean energy, zero-emission electric school buses. Arizona is home to some of the worst ozone pollution in the country, especially in the greater Phoenix area. Nearly half of the counties in the state have failing air quality grades, according to the American Lung Association’s State of the Air report. 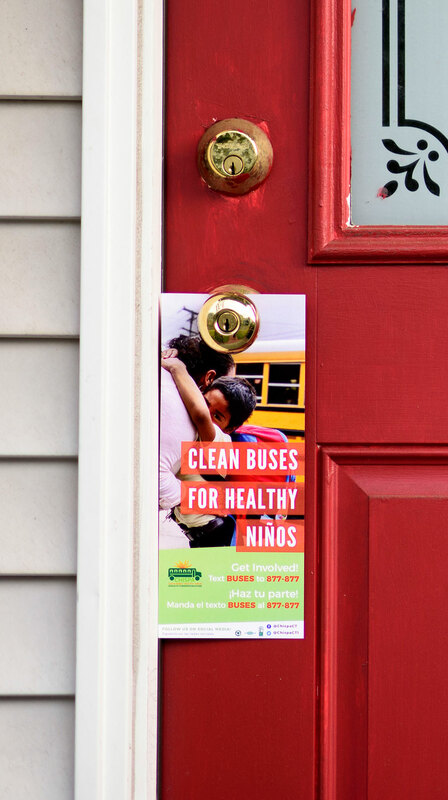 Across the country, approximately 25 million children take school buses, and are exposed diesel exhaust, which can negatively impact their health. In Arizona, there are approximately 300,000 kids who ride school buses to over 230 school districts, which serve more than a million students, over half of whom are Latino or black. With so many children exposed to pollution, it’s no coincidence that more than 1 in 9 suffer from asthma. Our children have the right to breathe clean air, and polluting buses shouldn’t endanger them in their pursuit to acquire an education. Diesel vehicles, including school buses, emit large amounts of nitrogen oxide into our atmosphere. This pollution can cause respiratory problems including asthma attacks, which are the leading chronic illness and the number one cause of school absences for children and adolescence. How is LCV’s Chispa taking action? LCV’s Chispa program launched its Clean Buses for Healthy Niños campaign here in Arizona. We need zero-emission buses for the nearly 90 million miles of school bus routes that crisscross our communities. The children and adults in our communities carry the horrible burden of the pollution that these buses emit. We’re organizing with our communities to build the political power necessary to ensure that clean bus fleets become a reality. Together, we can take a stand to let Governor Ducey know that we won’t wait for cleaner air. It’s time for #CleanRide4Kids now. In Arizona, Chispa is focusing its fight on clean school buses for Maricopa County, home to the largest school district in the state. It’s also the area with the highest number of children at risk for respiratory illness and the greatest exposure to the largest amount of ozone pollution. What is the VW Settlement for and how much money is available in my state? The VW settlement allots $2.7 billion for the Environmental Mitigation Fund. This mitigation trust is specifically for states to implement projects that reduce nitrogen oxide emissions, and replace diesel with cleaner technologies. Arizona’s settlement amount was determined by the level of pollution caused by the 10,000 VW diesel vehicles that emitted pollutants across the state. From the settlement, Arizona anticipates to recieve $57 million. Why the VW settlement? Well, VW cheated federal emissions tests, and polluted the air we breathe with toxins emitted by diesel vehicles that increases respiratory illnesses and furthers the effects of climate change. LCV’s Chispa Arizona believes these funds should be re-invested in initiatives that stand to enhance the air quality of local communities and school districts, especially in low-income and communities of color where students and families are most at risk of breathing dirty air, and are disproportionately suffering from pollution. In Arizona, the Governor’s office is working with the Arizona Department of Environmental Quality and the Arizona Department of Administration to decide where the money will go. The final plan will be submitted by September 2017. What’s the impact of switching from a diesel bus to a zero-emission bus? Clean buses mean cleaner air and healthier niños and communities. While zero-emissions buses may cost more up front, they cost 30 percent less to maintain than their diesel counterparts, and they reduce greenhouse emissions by almost 80 percent. Nitrogen oxide emissions from buses are particularly dangerous because they increase ozone pollution, and have detrimental impacts on our health, especially for children. Every diesel bus replaced with a zero-emission bus is equivalent to taking 27 cars off the road, and can save upwards of $11,000 per year in fuel and maintenance costs. First and foremost, sign the petition to Governor Ducey, and call his office by texting BUSES to 877-877.LCV’s Chispa Arizona staff is working with volunteers and promotores to fight for clean buses for healthy niños. We will get in touch and share ways for you to get involved. For more information contact Chispa Arizona Director, Masavi Perea at Masavi_Perea@lcv.org.